When children are removed from home, parents feel a level of grief and stress that can hardly be explained. Then they often face more stress, with things like losing a job because of mandated services, losing housing and juggling multiple services. When our bodies feel too much pressure and threat, stress can put us in an “act now, think later” mentality that makes it even harder to do what’s needed. Stress can also make it harder to learn and plan. These reactions can affect parents’ cases. Parents who have difficulty planning or cannot follow through are seen as unwilling to comply. In October, the Harvard Center on the Developing Child published a paper that explains how ”toxic stress” affects parents and children—and how child welfare systems can use that knowledge to improve practice. The good news is that there are things parents can do to help themselves and their children. Child welfare systems also can take steps to reduce parents’ stress responses so we’re more likely to succeed. 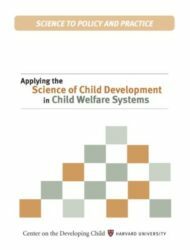 We interviewed Steve Cohen, author of the paper and a senior fellow at the Center on the Developing Child at Harvard University and the Center for the Study of Social Policy, about what individual parents and child welfare systems can do. Q: What is toxic stress? A: Everybody experiences stress in their lives. Experiencing some stress is good for children—challenges help us learn and grow, and even serious stress is tolerable. Hard things can happen but kids turn out just fine. Toxic stress really means “prolonged, extreme activation of the stress response system.” When we encounter things that challenge us, our bodies have stress reactions—our blood pressure rises, our hearts beat faster, hormones are released that prepare our bodies and brains to respond quickly. With support from caring adults, a child’s system will settle down when the stressful situation is over. That’s healthy. Toxic stress means that people stay in this highly agitated state for a long period of time. It’s a constant overload, and that has a bad impact on health, learning, and relationships, and can last a lifetime. Toxic stress can be dealt with. But it creates a set of challenges that can be really tough to deal with, and that people have to get help to deal with. Q: How does toxic stress relate to parents in child welfare? A: It relates in two ways. First, many parents will have experienced toxic stress in their own childhoods. That can put them at risk to overreact to stress in adulthood. And child welfare is stressful. When you’re stressed out, it’s hard to act the same as you do when you’re calm and connected. When child welfare gets involved, it’s hard for parents to feel safe, to use the skills they have, and to build the skills they need to get their children home. Knowing about toxic stress can help parents understand their own stress responses and how to cope. Second, knowing about toxic stress can help parents protect their own children and help their kids grow up in a healthy way. No matter what’s going on in your life, there is a certain type of interaction that can help your child. That interaction is called “serve and return”—moments where the parent is being responsive to what the child needs. That can be as simple as an adult responding with eye contact, words, or a hug when a baby babbles, gestures, or cries. When the parent and child are following each other’s cues, that can help kids feel safe and calm. As we learn more about the science of what helps kids develop, scientists have gotten more and more convinced that the only way to help children who have challenging experiences in their lives is through the adults who care about them and matter to them. Kids don’t grow up on their own. We need to help the adults who are responsible for those kids. Q: The paper gives clear recommendations for reforms. For instance, the section on “providing well-regulated environments that help build a sense of control” points out the importance of giving parents choices, providing checklists of expectations, and explaining the child welfare process so parents can see a future. What impact have you seen so far from sharing the science? A: We’ve seen that understanding the science helps people change their thinking. A lot of professionals in child welfare have been doing this work for a long time. It’s hard to take a fresh new look at your work. But when we talk about science, people often open up and consider new possibilities. 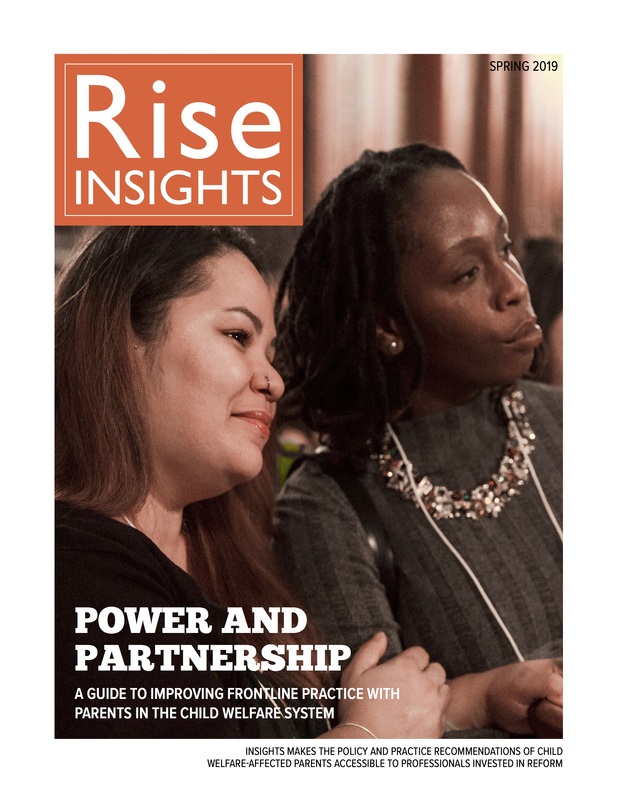 A big piece of bringing down stress on families and on frontline workers is addressing how all of the systems that affect families work together. Many times families are dealing with multiple government agencies, and they are all making different demands on the family. It can be very time consuming for caseworkers to help parents with housing, economic benefits, support services, and education or training programs. It needs to be easier for parents and caseworkers to know how to get what families need. Other changes that can make a difference may be very small. For instance, I saw a video that Rise made with ACS to train caseworkers, and in it a parent says, “I need little short sentences.” This parent may be quite an intelligent person who could normally understand long, complicated sentences. But when she’s talking with a caseworker, her stress level may be so high that it will be hard to take in complicated information. That’s something that would be true for any of us. If you were going to the doctor to talk about a really serious illness, you might feel scared and you might not trust yourself to remember everything the doctor told you. You might bring a friend along to help you understand because you would be under stress. If we understand these challenges in child welfare, we can think about what will help parents cope. Frontline staff can understand from the science how important it is just to have someone who believes in you. It’s protective against toxic stress to feel that someone is rooting for you. I think people in child welfare are starting to understand that. The paper quotes a judge saying, “It makes a tremendous difference, particularly for people who have previously experienced trauma, to feel that there is someone capable who believes in you.” Hearing that not just from advocates for parents but from a judge is a really nice sign. The reality when children are in foster care is that certain issues in families do need to be faced and addressed, so service plans are not only about what the parent wants to work on. But “motivational interviewing” is a technique that starts with recognizing that sometimes people have lost hope, and that the beginning of a relationship needs to be about helping parents feel hopeful. If parents can remember times when they were capable and successful, they can take the risk to start trying again. Caseworkers also need to feel that they’re believed in. Toxic stress also affects so many workers. They need support to be able to pause and listen to people, to pay attention to what parents have to say and help them think. Q: What can parents themselves do to protect themselves and their kids from toxic stress? A: The most important thing is that parents are responsive to their children. Those “serve and return” moments where the parent and child are following each other’s cues can help kids feel safe and calm. Kids also are calmer and have an easier time in the world when their home environment isn’t changing all the time and they can count on things happening regularly and routinely. For many parents, their world isn’t stable and calm. Trying to provide a calm environment to kids isn’t easy when your world keeps changing. But it is possible for parents to create simple routines at home. Take bedtime—if you’ve got little kids, just getting them into bed can be challenging and cause stress. Simple routines around getting to bed can help, especially if families are under stress. The Center on the Developing Child is working with professionals across the country to figure out how we can give information about toxic stress to parents in a way that’s helpful. Parents can also read the paper or watch the videos and think for themselves about what can help their families. These videos from the Harvard Center on the Developing Child can introduce parents and child welfare professionals to toxic stress. Core Concepts in Early Development can help parents and caseworkers understand how early experiences affect development. The second video explains serve-and-return interactions and their impact. Ready4Routine can encourage parents to see what’s holding them back as parents and how they can overcome to connect with their kids. Intergenerational Mobility Project can show parents and caseworkers how parents can take control and take it step by step to reach their goals. In Brief: Resilience Series shows how people can bounce back from adversity.